Prophet Benjamin Eugene Harrington Jr.
Prophet Benjamin Eugene Harrington, Jr., age 36, of 401 W. Main Street, Benson, formerly of Raleigh, departed this life on Friday, January 25, 2019 at Wayne Memorial Hospital, Goldsboro. Funeral, 12 Noon, Saturday, February 2, 2019, The Gathering Place, 3500 Wood Meadow Parkway, Raleigh. Bishop Ralph Donnie Graves, Pastor. 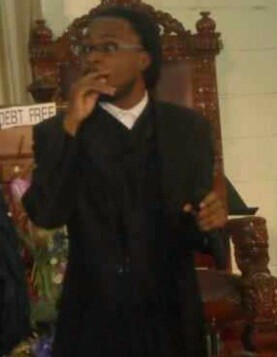 Overseer Marshall Blackmond, Officiating. Apostle Vertise Rozier, Eulogist. Interment, Rand Street Christian Church Cemetery, 213 Haywood Street, Garner. Survivors; mother, Dale Fulwood Harrington of the home; father, Benjamin Eugene Harrington Sr. of Monroe; sister, Cynthia Harrington of Benson; brother, Ellis Harrington and Thaddeus Harrington both of Benson; and a host of other relatives and friends. Public viewing, 12 Noon - 8 PM, Friday, February 1, 2019, at the funeral home.